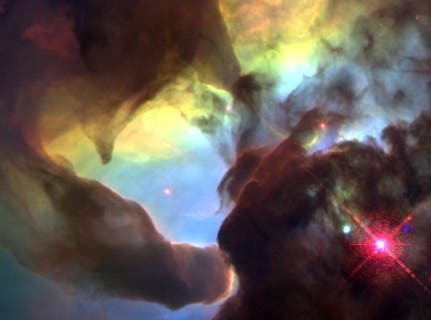 Phosphorus is not abundant in the universe or in molecular clouds as seen above the Lagoon nebular that create the building blocks of life, yet it is vital to life on Earth, even though our planet doesn’t provide us with very much of the element to work with. A team of astrobiologists, led by Matthew Pasek of the University of South Florida, is now studying how phosphorus biochemistry may have originated at the dawn of life. Their work is being supported by NASA’s Exobiology and Evolutionary Biology program. Through their work, Pasek's team hopes to provide the phosphorus chemical landscape through the first two billion years of Earth's geologic history. This could help uncover when and how life came to depend so strongly on this element. "The time and mode of phosphorus entry into life is a really intriguing puzzle," says Nicholas Hud from Georgia Tech. Hud believes phosphorus may not have been one of the ingredients in the life's first recipe. "Nucleic acids, proteins and lipids all use phosphorus, but we can imagine that it was a later substitution of simpler molecules," Hud argues. In nucleic acids, for instance, the "glue" role of phosphate could have been filled by glyoxylate, a molecule still used in life today. Hud thinks phosphorus might have started out as a trace element in a few biological processes, and only later did life realize all the potential that phosphorus has for life. "Once life developed the molecular machinery that allowed incorporation of phosphorus, and even the 'harvesting' of phosphorus, life would have moved to a higher level," Hud says. "The inclusion of phosphate likely represented a major evolutionary advance in life (if it was not there at the very beginning) and therefore is extremely important for understanding the origin and early evolution of life." Phosphorous is scarce on the Earth, particularly at the surface, and is primarily found in some type of phosphate. Pasek’s team hopes to provide the phosphorus chemical landscape through the first two billion years of Earth’s geologic history. This could help uncover when and how life came to depend so strongly on this element. To understand how phosphorus obtained its prominent role, scientists are modeling the early geochemical environment on Earth and in space. The most common elements in a typical cell are hydrogen, oxygen, carbon, nitrogen, phosphorus and sulfur. All of these, except phosphorus, are in the top ten of most abundant elements in the solar system. Phosphorus comes in at number 17. "Phosphorus is the least abundant element cosmically relative to its presence in biology," says Matthew Pasek of the University of South Florida. This scarcity of phosphorus is even more acute on the Earth's surface, where much of the phosphorus is locked up in certain minerals that life has difficulty making use of. So how did life come to depend on this relatively rare element? Pasek is heading an effort to account for the possible chemical pathways that phosphorus could have taken to become available for life on the early Earth. Can't get enough Phosphorus doesn't usually get as much attention as other essential nutrients like calcium and iron, but the element P shows up in a surprisingly wide range of biological molecules. For starters, phosphorus is an important structural element in DNA and RNA. Both of these genetic molecules have a sugar-phosphate backbone. The phosphate (PO4) works as a kind of "super glue," since it has three oxygen atoms that will carry charges in solution. Two of these oxygen atoms form ionic bonds with two neighboring sugars, while the third oxygen is left "dangling" with a negative charge that makes the whole DNA or RNA molecule negatively charged. This overall charge helps to keep the molecule from drifting out of its proscribed location. The backbone of standard DNA (the blue spiral ribbon-like structure in the image below) contains an alternating chain of linked phosphate and sugar molecules. Not many molecules could perform this three-charge juggling act. Arsenate is one possibility. Recently, a group of researchers claimed to have found a microbe that could use arsenate in place of phosphate, but controversy remains over this presumed discovery. "The jury is still out over arsenate, but it's clear that phosphate is the best option when given a choice," Pasek says. Phosphate plays other roles in the cell besides that in DNA. It shows up three times in adenosine triphosphate, or ATP, which is a vital form of energy storage in cells. Many biological functions require the energy from the breakdown (or burning) of ATP, which is often called the "molecular unit of currency" in energy transfer. "The human body makes its weight in ATP each day and burns it," Pasek explains. Phosphorus also has an important role in vertebrates, whose bones and teeth contain apatite, a highly stable phosphate mineral. Getting your vitamin P Because of its vital role, all organisms on Earth must find a source of phosphorus. Humans and other animals get their phosphorus from eating plants (or by eating animals that eat plants). Plants pull out phosphorus compounds from the soil, but a lot of this is recycled material from decaying organic matter. One of the best known molecules for carrying energy around our bodies is adenosine triphosphate (ATP). Plants aren't able to recycle all of the available phosphorus in the soil, so some of it ends up going into the ocean through runoff. There, it can be used by marine organisms, but eventually the phosphate settles on the seafloor where it becomes incorporated into rock sediments. Once the phosphorus is locked up in insoluble minerals, it takes a very long time for it to return to a form that plants and other organisms can use. Indeed, the phosphorus cycle is one of the slowest element cycles of biological importance. Not satisfied with waiting for geological processes to free up phosphorus, humans currently spend a lot of effort mining "rock phosphate" and chemically modifying it to make fertilizer. And there's the rub for astrobiologists. The first life forms wouldn't have had anyone to sprinkle P-rich fertilizer on them, so where did they get their phosphorus from? A different path Most of the phosphorus on the Earth's surface is found in some type of phosphate. The reason, Pasek explains, is that phosphate is the lowest energy state for P in our planet's oxygen-rich environment. But other—more reduced—phosphorus compounds exist as well. Enlarge The Phosphorus cycle. "Reduced phosphorus is more chemically reactive than phosphate," Pasek says. This extra reactivity could have helped phosphorus sneak its way into the game of life billions of years ago. Examples of reduced phosphorus compounds include phosphides. These molecules are typically combinations of phosphorus and metals, like the zinc phosphide found in rat poison or the iron-nickel phosphide called schreibersite. "We can't get out core material from Earth, but we do have access to the core material of asteroids that have broken apart to create meteorites," Pasek says. Phosphides tend to form wherever oxygen is scarce and metals are abundant. Hence, the cores of most astronomical bodies have phosphides. Phosphides can also form when a phosphate mineral is struck by lightning or a high-energy impact. Pasek and his colleagues have studied geologic samples of phosphides, and they have found that most of the phosphides on the Earth's surface came from meteorites. Over time, much of this material has evolved to phosphates. The team estimates that 1 to 10 percent of the phosphates currently found on Earth came from meteorites. Although phosphides and other reduced phosphorus compounds play no major part in current biology, they may have been more prominent as life struggled to make a foothold on this planet. With computer simulations, Pasek and his colleagues are modeling P-related chemistry at different time periods from the beginning of the solar system up to the early stages of life. They focus on the Earth, but they are also looking at other places besides where P chemistry may have been important, like comets and the moon Titan. They have augmented their simulations with experiments, in which schreibersite and other meteoric minerals are added to a "primordial soup" of water and organic molecules. The mixtures have produced some organo-phosphorus compounds that are similar to those found in biology. "We have had good luck with our experiments so far," Pasek says.